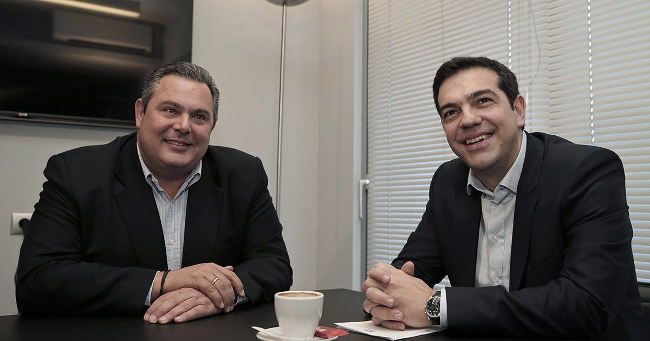 There has been a good deal of discussion about the recent elections in Greece and, in particular, SYRIZA’s decision to form a parliamentary alliance with the ultra-nationalist Independent Greeks (ANEL). Naive, because how is it possible to have given any thought to handing an ultra-nationalist party the keys to the Ministry of Defense, and then not expect them to set about recruiting a paramilitary capacity? I am not sure how this can be described as “tactical,” as if there are no consequences that arise from it. Perhaps there are no directly negative consequences for the parliamentarians of SYRIZA, but that only tells us what the demographic composition of SYRIZA parliamentarians has increasingly become, particularly more recently as they sought to poach longstanding MPs from the other major parties. So, ultra-nationalist, anti-Semitic, clerical misogynists and homophobic, racist, Islamophobic conspiracy nuts in charge of Defense. What could possibly go wrong? Nor am I sure how the traditional accomodation of ultra-nationalists by social democrats—under the patently nationalist headings of “anti-globalisation,” “anti-neoliberalism,” or the deeply anti-Semitic trope of “anti-finance capital”—could reasonably or accurately be described as a break with European political conventions. There is surely an argument to be had about ways through and beyond this, and many have tried to put the case for such much more politely than I have here, only to be met with tone-deafness at best or, at worst, combinations of childish tantrums and authoritarian demands to be loyal to those willing to sacrifice those who are already vulnerable to ultra-nationalist violence so as to attain government. So, let’s be blunt, since there is nothing polite about making excuses for alliances with groups who happily justify the repression of and violence toward racial minorities, non-citizens, queers and women. SYRIZA might have explored agreement on a range of specific points with a range of groups; instead they agreed to form an ongoing alliance with an ultra-nationalist party from the Right, whose two conditions they also agreed to: the Ministry of Defense, and to support the supremacy of the clerical conservatives within education and other areas. That, in effect, means continuing state support for anti-Semitism, Islamophobia, homophobia and misogyny—and in the last of these instances, it means supporting the highly gendered division of labour, which does not bode well for any strategy that seeks to go beyond austerity, but whose shape is already evident in the composition of the new government. While I’ve not read every contribution to the debates around SYRIZA’s election, it is notable that those insisting loudest that they should be spared criticism are unlikely to be subjected to the violence of the ultra-nationalists and far Right. Which is another way of pointing out that while affect is certainly at issue here, there might be a good deal more thought given to the contours and distinctly racialised, gendered lines of those affections, and possibly before giving oneself licence to demand those affections should be supported by everyone. Naive also, because much as some people obviously enjoy a messianic or instrumentalist view of the state and its role in social change, there is simply no evidence for such fairy-tales, though these tales of The Subject remain functional to the mobilisation of amenable party volunteers. In any case, and speaking of the proverbial ‘skin in the game,’ I’m particularly struck by the shifting ranges of whiteness, blackness and colour within all of this. Greeks may well be regarded as people of colour in northern Europe, on occasion and in other contexts, perhaps as Black—as the debate among global neo-Nazis made clear with regard to the status of Golden Dawn within those circles. But leaving aside the infinitely regressive debates over the purity of the classifications of racial purity among self-confessed National Socialists and White Supremacists, racism is by no means confined to Golden Dawn and SYRIZA, in Greece, are white. 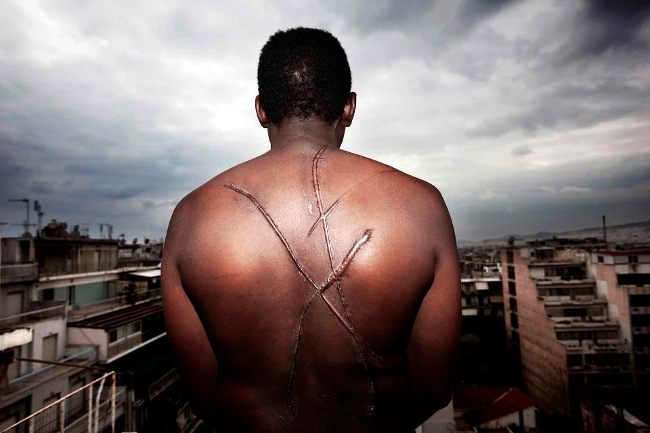 This is why it was possible for the beatings and murders of non-citizens to proceed with impunity (and tacit encouragement by the police and government) on the streets of Greece for years, for mass graves of asylum seekers to be unearthed on the borders of Greece, and for there to be a more voluble and widespread outcry against fascist violence only when Golden Dawn stepped beyond a certain racialised boundary and murdered “a Greek son,” Pavlos Fyssas. But as many have sought to remind us before and since, Fyssas was not the first nor last victim of fascist violence in Greece. Given all of this, it’s extraordinary to come across reiterations of anti-imperialism that have sought to explain away the racism (and everything else) of ANEL as a function of anti-imperialism or anti-colonial history. Firstly, this is patronising nonsense and evacuates any progressive, let alone radical meaning to the practices of solidarity. 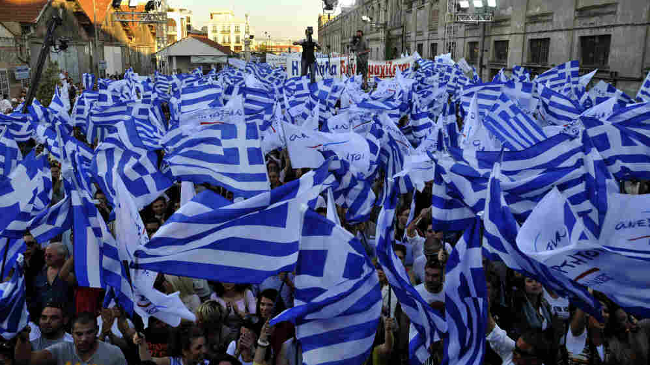 Secondly, and more importantly, it hinges on the false homogenisation of people in Greece (all Greeks look and are the same), buys into the very racism that is premised on myths of homogeneity, and excuses the violence that has been deployed on a routine basis within and at the borders of Greece so as to give shape to this myth. Thirdly, some of the most virulent fascist and distinctly racist politics have been borne of fantasies of victimisation and loss, in which the presumed subject who has lost (dignity, among other things) is construed in terms which conflate family, race and nation: the German National Socialists’ efforts to restore (their words) the dignity of the German nation after the Versailles Treaty;* the Australian settler colony’s introduction of the White Australia policy by (mostly Irish-affiliated) unions against the English Crown’s allegiances to China; Zionism; et cetera. Finally, while many are congratulating SYRIZA on breaking the hold of austerity politics in Europe, it seems to me that the more difficult question is whether or not SYRIZA can break with this conflation of family, race and nation. That, surely, is what Ριζοσπάστη means, or might do so. That would be the radically anti-foundational move that would query the violent premises of austerity politics and economics, finance and, not least, Europe. *Regarding national dignity, I recommend a perusal of the laws passed by the German National Socialists from the 1930s. They almost invariably refer to the “dignity” of the German nation, made it illegal to undermine said “dignity” in the press, and so forth. promised citizenship for second generation migrants but said nothing about immigrants’ detention centers. Some days ago Panousis (Police minister) said that the fence on river Evros must be preserved (it was partially destroyed by a flood though!). Three days ago a Syrian refugee was found guilty for the Farmakonisi tragedy and he was sentenced to 145 years of imprisonment and a fine of 570,500 euros (Greek cost police officers were cleared of all charges). And 26 immigrants are on hunger strike for 7 days now in Patras prison because, although they have served their sentences, they remain in custody for 11 to 14 months more, because they were arrested without documents. This article seems to suggest that they might at least actually replace the detention centres with some kind of “open” centres, presumably not concentration camps: http://www.watoday.com.au/world/greece-pledges-to-shut-immigrant-detention-centres-20150215-13f4da.html If not, these do seem like fairly strong and incongruous words in support of doing so. At the same time, it is truly bewildering that people seem to want to pretend to believe that this alliance with far rightists will have no significant consequences for anyone. 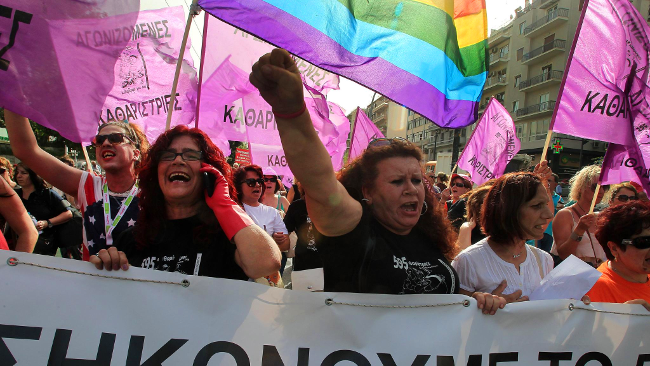 The recent draft TPTG text on SYRIZA, in particular, suggests that SYRIZA’s transition toward a body willing and able to manage reproduction of a version of the status quo has been going on and accelerating over the last couple of years, manifest in their relation to social movements and changing policies in almost every area – changes reflecting trajectories sufficiently evident that it would seem to take some effort and commitment to not notice. What that will mean for border control and those without citizenship remains a somewhat open question, which would seem a good enough reason for people to be critically addressing developments in Greece and SYRIZA, rather than seeking to become cheerleaders who would like to police criticism of their team. Quite notably silent on border control. Most of it apparently written before the alliance with far rightists, but still. In any case it paints an interesting portrait.